"I highly recommend the diet program explained in Eat Right 4 Your Type by Dr. Peter D'Adamo. When I read the book in the fall of 1997, I was impressed with D'Adamo's research behind the diet and the simple logic that is the diet's foundation." Welcome to the first science that understands you as a biochemical individual. Following decades of ongoing research and clinical work, Dr. D'Adamo created The Blood Type Diets, a way of eating and living that has transformed the health of millions. His first book, the New York Times best-seller Eat Right 4 Your Type started a health revolution over ten years later that continues ever-stronger. With more than 5 million copies in print in over 50 languages, Eat Right 4 Your Type celebrates its 20th year as an unprecedented non-stop bestseller in hardcover, and was named as one of the ten most important health books ever written by respected health publishing analysts. We invite you to explore our website, interact with fellow BTD'ers and discover a powerful new world of individualized opportunities for better health. Dr. D'Adamo's new book Change Your Genetic Destiny examines the possibilities of epigenetics and the use of diet to profoundly alter gene function and genetic destiny. Appear to be the odds that your health will improve by following the right diet for your blood type. 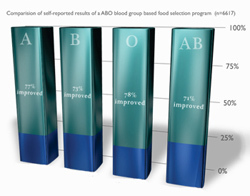 The facts are clearcut: In the 6617 individuals who reported their results from following the Blood Type Diet for a period of one month or more, three out of four (71-78%) had significant improvement in a variety of health conditions. Weight loss was the effect most often observed but a number of reports detailed improvements in digestive function, resistance to stress, overall energy and mental clarity. The results certainly appear to question many of the standardized one size fits all diets advanced by the diet gurus, governments and agribusiness. Genetic testing and personalized diets are now quite popular and perhaps nutrition science is catching up with The Blood Type Diet. That's O.K. --we're old hands at it. Dr. D'Adamo's work builds upon theory advanced by his father almost a half-century ago. Perhaps that is why on average of five out of the 25 bestselling health books on amazon.com are books written by Dr. Peter D'Adamo, including the #1 bestseller in the category. His books have sold over 6 million copies worldwide and his works have been translated into over sixty-five languages. Dr. D'Adamo's books remain popular bestsellers because the recommendations contained inside them work --most people who eat right for their type feel better. Word of mouth and individual success stories often does the rest. Over the last ten years he has trained over 300 health professionals in his work, which he continues to research clinically. Dr. Peter D'Adamo developed Methyl 12 Plus to promote and maintain your natural energy levels and optimize your body's methylation capabilities. It may also help to regulate sleep patterns.